This automatic bicycle chain lubricator promises up to 12 Watt power gain, 15% improvement in efficiency and it maximises drivetrain longevity. Here's how it works. See video. The more than marginal gains offered by this automatic chain lube system has inspired professional team Orica-Scott (previously Orica BikeExchange) to fit it to their bikes for the 2017 season. If you own a top quality road bike with perhaps a sub-kilo carbon or ti frame and system built wheels, and you want to ensure it works to its full potential, Flaér is well worth considering. Did we mention up to 12 Watt power gain and the 5% improvement in drivetrain efficiency as tested by Napier University, Edinburgh? In the box, you get all you require to fit the Flaér Revo Via Lubrication System including. 125ml bottle of Via Fluid - enough for a minimum 35 hours riding. Road.cc reckon you could fit this whole system to the bike in about 20 minutes (or we'll fit it for free if you purchase it with a new bike). See video. 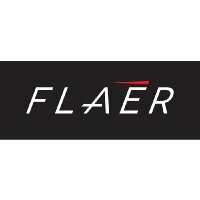 Flaér are based in Glasgow. Their original bicycle lube product was the Scottoiler (a simplified version of the company's original motor cycle lubricator). This mechanical semi-automatic chain luber allowed the cyclist to oil the chain while riding. Although it was far less sophisticated than the Flaér Revo Via System, Scottoiler had it's fans, including Graeme Obree, who almost certainly loved its home-made vibe. Despite these endorsements, riders with high quality bikes resisted the Scottoiler because it involved zip-tying or taping lengths of tubing from the head or top tube to the rear derailleur. This was anathema to road riders who like to keep their bikes clutter free. Lack of demand meant that Scottoiler ceased production. I (the Bike Co-op's Ged) mention this because I've been using the Scottoiler on my Specialized Roubaix for seven years and it's still running on the original chainrings and cassette. That's twice as long as I usually get out of a drivetrain so I can vouch for the principles behind this innovation. I can also vouch for the quality of this company's lubrication fluids, which I've found to be cleaner than any other I've tested. The Flaér Revo Via Lubrication System takes these principles and improves on them in a far cleaner more integrated package with a much shorter cable run from the lube reservoir, situated at the bottom of the frame down tube, to the rear derailleur jockey wheel where the lube is dripped on to the chain. If I ever get a new road bike, I'll be adding some Flaér to it.